iDEAL is the most used payment method of the Netherlands. 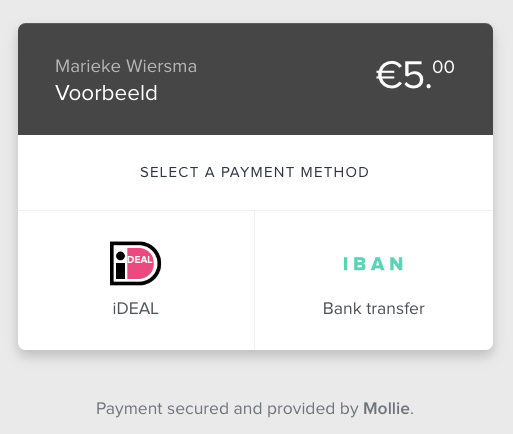 It's possible to make a payment using iDEAL via the 10 biggest Dutch banks: ABN AMRO, ASN Bank, Bunq, ING, Knab, Rabobank, RegioBank, SNS Bank, Triodos Bank and van Lanschot. The payment method is based on a payment transfer, however with iDEAL the amount and the account number of the beneficiary are already filled out. One of the advantages of iDEAL is that the payment is guaranteed: the consumer will not be able to charge back the payment after completing it. After a consumer has chosen to use iDEAL for its payment, the consumer selects its own bank. The consumer will then be redirected to the bank's secure online environment, where the payment will be concluded. Banks use different methods to verify the payment. This can be done with the use of a TAN-code received via SMS, a QR code in an app or an e.dentifier. The payment will immediately be processed after verification. As a vendor, you will know within fifteen minutes what the status of the payment is. How do I integrate iDEAL? There are various ways of integrating our payment methods into your website. You can, for instance, let your consumer choose their preferred payment method on your website. In that case, the consumer chooses iDEAL and selects their bank when they are still on the website. The consumer is then redirected to the secure online environment (online banking) of their bank and makes their payment there. The consumer clicks on iDEAL and is redirected to the next screen where they select their bank. The consumer is then redirected to the online banking environment to make the payment. Regardless of how the payment methods are integrated, the consumer has 15 minutes to complete payment. After these 15 minutes, the status of the payment is immediately known and communicated to your website, so that, for instance, an order is marked as 'paid'. You can also immediately look up the transaction in your Mollie account.